Stade Chaban-Delmas, until 2000 known as Parc Lescure, was built in the 1930s, though football had already been played at the site from as early as 1912. Parc Lescure officially opened on 12 June 1938. The first match was the World Cup quarter-final between Brazil and Czechoslovakia (1-1). Later on in the tournament the stadium would also host the match for third place between Brazil and Sweden (4-2). Parc Lescure remained largely unchanged in the next fifty years. In 1985, it set its record attendance when 40,200 people visited a match between Girondins and Juventus. The stadium underwent its first major redevelopment in 1987 when the cycling track got removed and the stands were extended towards the pitch. Further renovations were made in the mid-1990s to prepare the stadium for the 1998 World Cup. During the World Cup, Parc Lescure hosted five group matches and the round of 16 match between Croatia and Romania (1-0). The stadium changed name in 2000 to Stade Chaban-Delmas, in honour of former mayor of Bordeaux Jacques Chaban-Delmas. Stade Chalban-Delmas has the longest players’ tunnel of any stadium in Europe. It measures a total of 120 metres. In 2015, Bordeaux moved to the new Matmut Atlantique stadium, built to provide the club with better facilities and as a playing venue for the Euro 2016 tournament. Stade Chaban-Delmas has since exclusively hosted rugby matches and will continue to do so in the future. Stade Chaban-Delmas is located towards the east of the city centre of Bordeaux at less than 2 kilometres from City Hall or Place de la Victoire. The walk should take about 20 minutes. The distance to Bordeaux’s main railway station, Gare St-Jean, is slightly longer, about 3.5 kilometres. From the historic city centre the stadium can be easily reached by tram. Take tram A from the Cours d’Alsace Lorraine in the direction of Mérignac Centre and get off at stop Stade Chaban-Delmas. The journey will take 10 to 15 minutes. From Gare St-Jean take bus 9 in the direction of Brandenburg, and get off at stop Stade Chaban-Delmas. The ride will take 20 to 25 minutes. Buses go every 10 minutes. From the airport take bus 49 into town. Get off at stop Hôpital Pellegrin, and walk a further 5 minutes to the stadium. 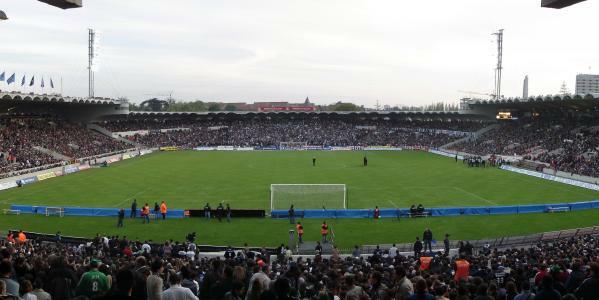 Stade Chaban-Delmas lies along the “Boulevards” of Bordeaux, a set of avenues called “Boulevard” that circle around the city centre. If arriving by car, make your way to the boulevards and follow the signs to Centre Hospitaliers. Stade Chaban-Delmas is located in a rather quiet residential area, but it being France there is always a café, brasserie, or restaurant around. Still, finding something to eat and drink in Bordeaux’s city centre may be a better idea. There are a few hotels that are located at about 10 minutes walking from the stadium, which include La Maison Cachée, Hôtel Alton, the All Seasons Bordeaux Meriadeck. Click here to see all hotels near Stade Chaban-Delmas. Alternatively, you can find a hotel in Bordeaux city centre, and if you choose something in the south-west of the centre you can even walk to the stadium. Hotels tend to be somewhat cheaper near Gare St-Jean, which also has a spot of nightlife close near the docks. Girondins.com – Official website of FC Girondins de Bordeaux. Bordeaux-tourisme.com – Official website of the Bordeaux tourist office. InfoTBC.com – Bordeaux public transport information. went to see the stadium in july 1966 when I stayed in nearby M/erignac chez my family’s former au-pair girl. Was quite impressed.